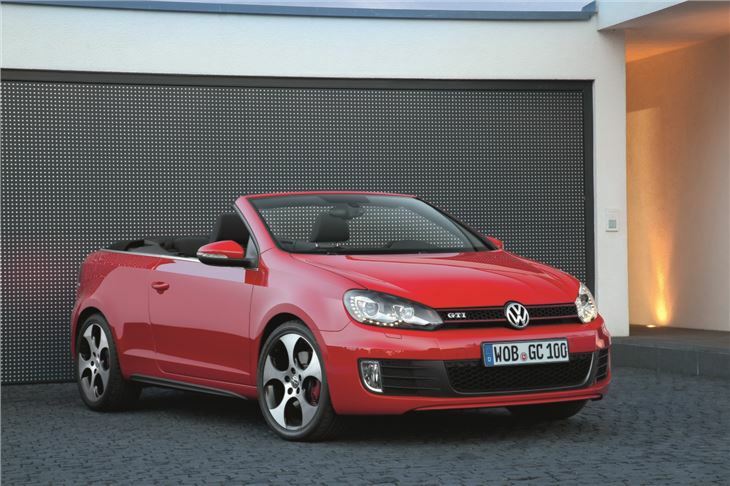 The return of the Volkswagen Golf GTI Cabriolet has been a long time coming. The old MKI Cabriolet was last seen in 1993 - the same year that Take That were topping the charts the first time round - and there hasn't been a replacement since. 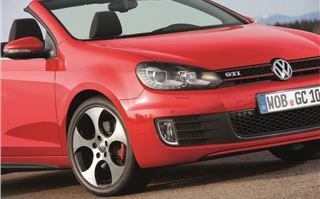 Power came from a 1.8-litre engine that pumped-out 112bhp. Back then the Golf wan't carrying so much weight, so that amount of power - that today you'd expect from an everyday small hatch - was more than ample. But, as with the Take That boys, the Golf has grown up and filled out. 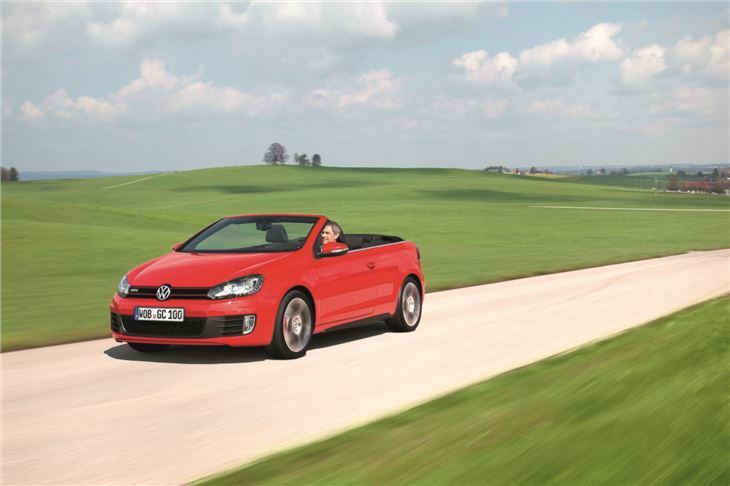 And the cabriolet is the heaviest of them all, as the extra weight for the roof mechanism and chassis reinforcement means its 140kg heavier than the hatchback. More bulk calls for more power, which now comes from the familiar 2.0-litre TSI turbocharged four-cylinder that has an output of 208bhp. Even so, it's almost half a second slower than the three-door hatch. Out on the road it provides a tidy drive. 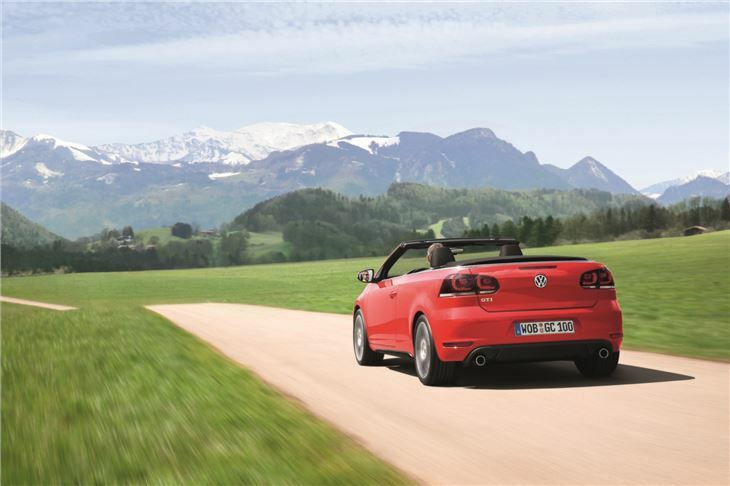 With the same chassis reinforcement as the standard Cabriolet, there's no noticeable body flexing and there's no vibration noticeable through the rear-view mirror, even when it's being pushed hard. Body control is similarly impressive, with minimal bodyroll in corners and buyers also benefit from Volkswagen's pseudo locking differential system 'XDS', which provides traction by braking a spinning wheel. The steering - which is carried over from the hatchback - is decent too with good accuracy and feedback. 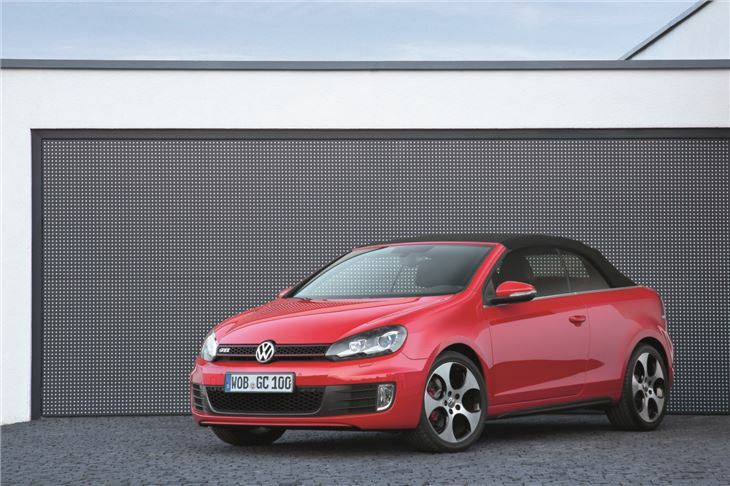 But it's not quite a GTI in the same way that you'd expect from the hatchback. It's certainly quick, but lacks the edge that makes the hatchback hot and not just warm. It's 0.4 seconds slower than than the hatch and this is noticeable on the road. It may be quick for a convertible, but doesn't have the edge to justify the GTI badge. That said there are other benefits that you can't experience with the hatch. 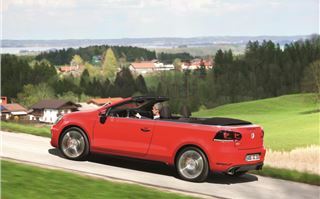 Drop the roof and, from 2500 rpm, you can truly enjoy the turbo whistle and exhaust burble from the 2.0-litre engine. 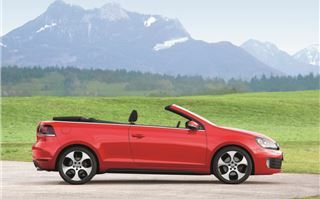 How can you tell that this is a GTI rather than a standard Cabriolet? Well, the exterior benefits from polished 'Shadow Monza' 18-inch alloys, lowered suspension and a black honeycomb grille with red horizontal highlights. 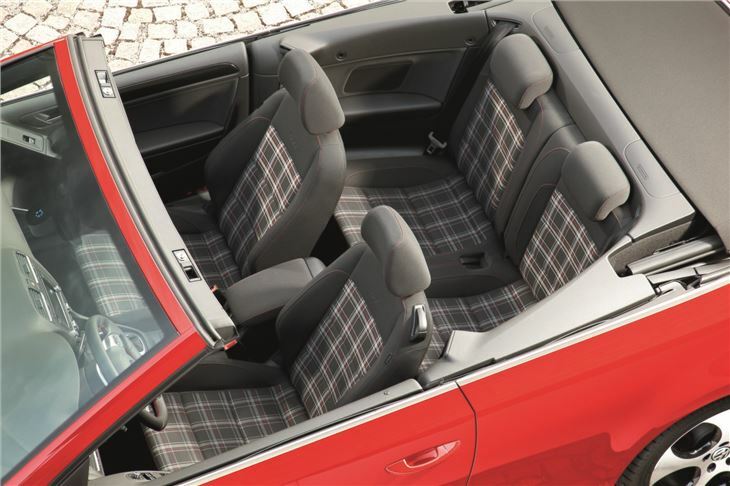 Elsewhere it's largely as you'd expect a Golf Cabriolet to be. That means access to the boot hatch is awkward and offers just 250 litres (although to be fair, that's more than a MINI Cabriolet or Mazda MX-5) plus a fabric roof that lowers in 9.5 seconds and works up to speeds of 18mph. 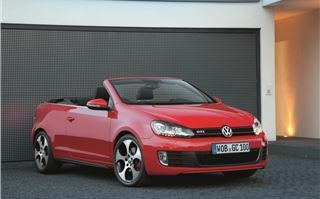 Pricing could be the stumbling block that prevents the Golf GTI Cabriolet from being a rip-roaring success. 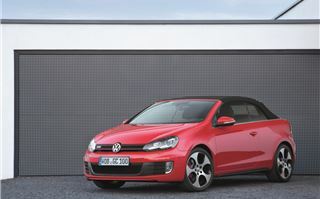 At £30,000 for the DSG version, it's only slightly cheaper than an Eos - and you get a metal folding roof with that. 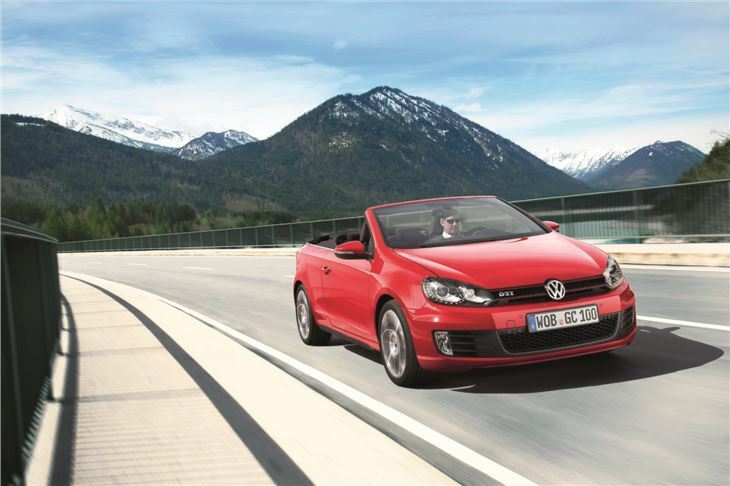 Or, take a scan of the standard Golf Cabriolet price list and you'll see that both the 1.4 TSI and 2.0-litre TDI can be had for around £25,000. 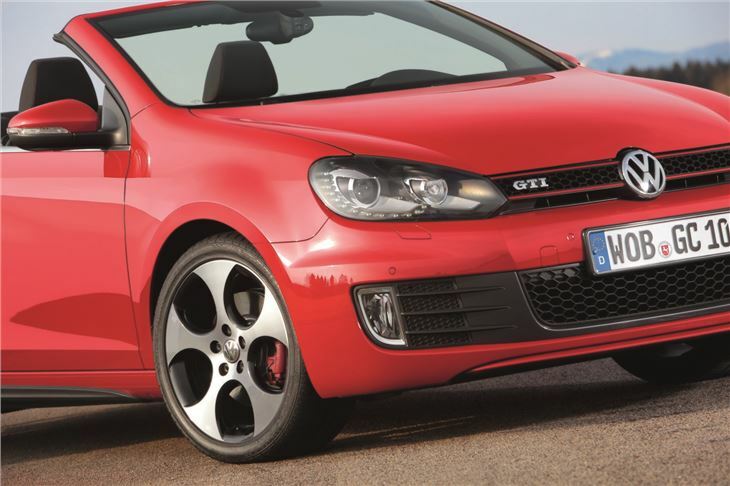 It makes the additional £5,000 for the GTI seem rather steep. 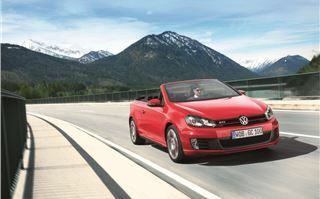 Full range review of the Cabriolet version of Volkswagen's popular hatchback.